what to do in blowfish city? 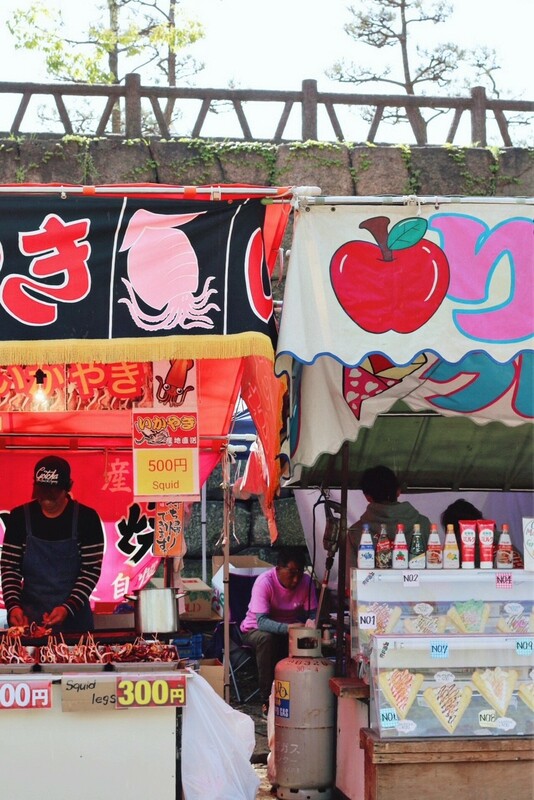 Osaka will always hold a place in my heart for being the city where I ate my first okonomiyaki. It is a dish that contains everything you can imagine, and is prepared on a hot plate in front of you. 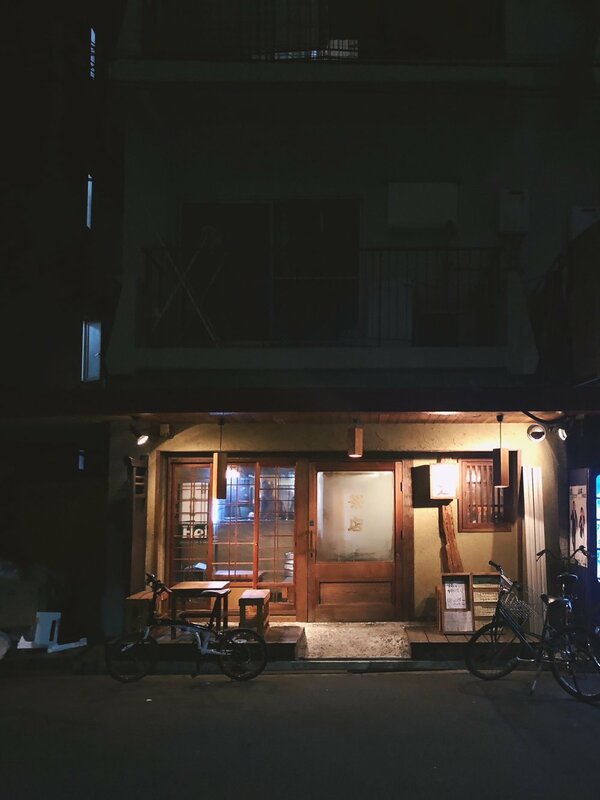 It is also the place where we came up with the idea of “brave dinners” which means entering restaurants that give no indication of what they serve at the outside (Japanese restaurants have the tendency to only serve one dish, or a variety of it. So sometimes a place would offer okonomyaki… or hot pot, or rice bowl, and nothing else.) Spoiler: it was a success every time! The number one sight in Osaka would probably be the castle, and I loved seeing this pretty building that I’ve know from the iphone emojis in real life. It is located in a park that is filled with Japanese ornamental gardening and cherry trees, and sits on top of a little hill which also makes a good viewpoint. The way to castle was framed with cherry trees, and many people were having picknicks and photoshoots among the pink blossoms. 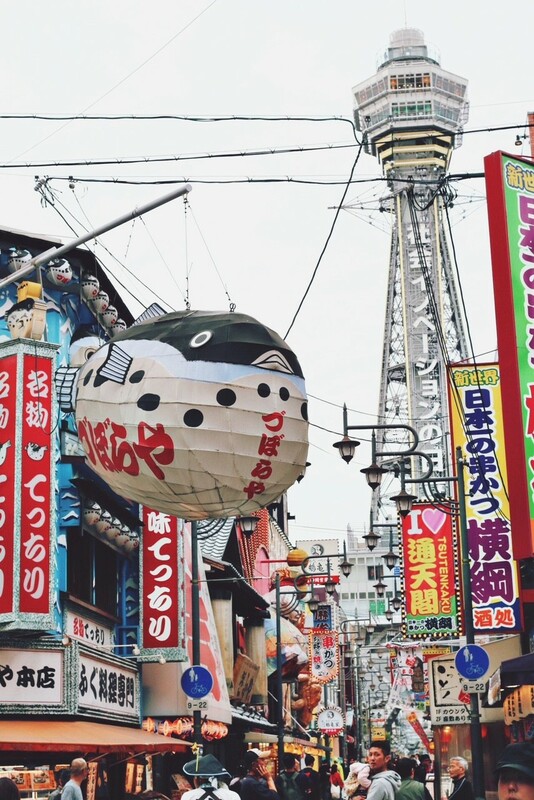 Osaka is famous for their offering of blowfish dishes, which is heavily restricted. So restaurants which offer the rare delicacy advertise it with huge blowfish balloons at their front door. It looks cool in the streets! I haven’t tried any blowfish though. 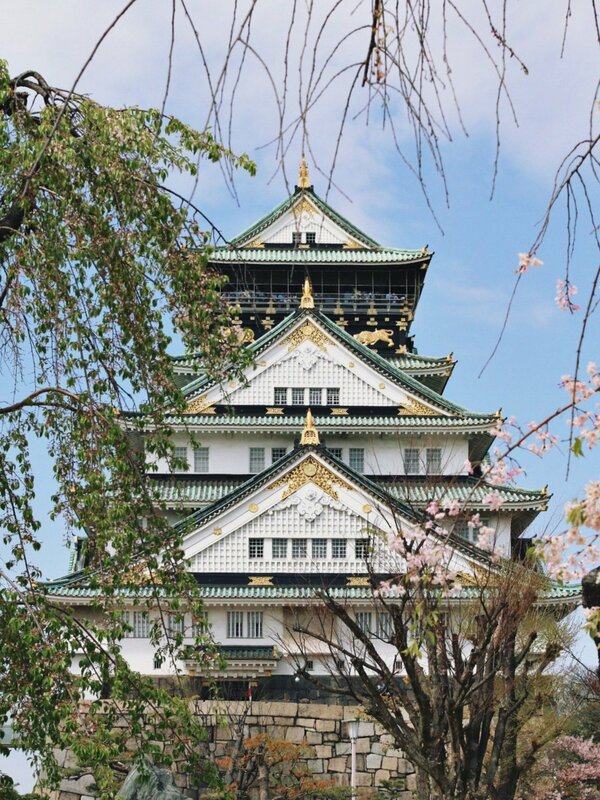 How pretty is the Osaka manhole with castle pictured? I mentioned okonomiyaki above, and this is what the table in front of your could look like if you order it. The ingredients are various, but most of them contain potatoes, cabbage, cheese and eggs as a base and are topped with meat or veggies, more cheese, mayo, bbq sauce, bonito flakes, seaweed… you name it, it goes into the okonomiyaki. “Anti-social dinner” at Ichiran (there are dividers between the seats at the bar, you order from a machine, you basically do not talk to anyone during the process). The Ramen is the best I ever had and I can’t wait to have it again some day! A small restaurant with no indidaction of the menu, we liked trying these out. This is what I got when I ordered the vegetarian option at the chicken resturant. It looks a bit odd, but it was delicious! 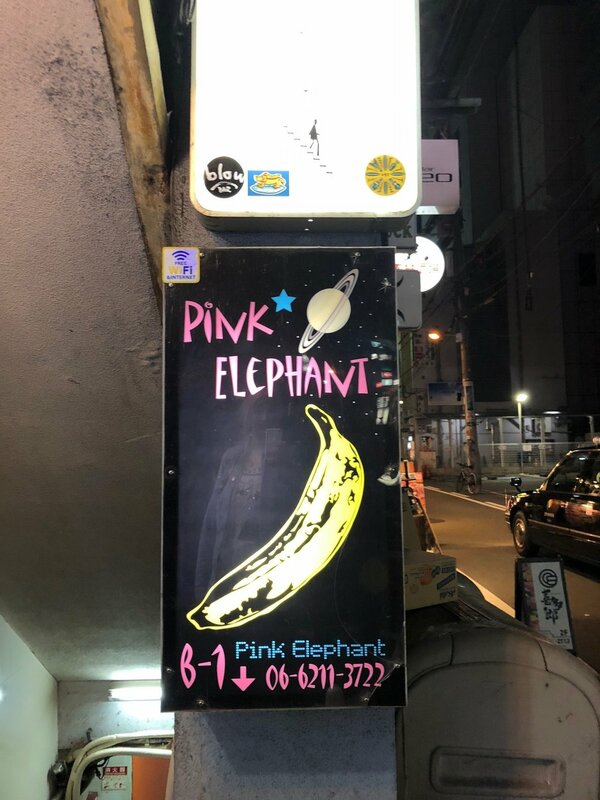 We went to quite a few bars in Osaka, but there is hardly any picture proof. I can recommend exploring a bit and look behind closed doors to fin hidden places and the tiniest bars, where a bartender serves 4 people and the room would not even hold more than that. There are places with a theme (such as a Rolling Stones bar, a 60s space bar…the list is endless) and it is fun trying them all out. Some have a cover fee, most of the bartenders and guests try and have a conversation with you, sometimes you get a little snack, often you can wish your favorite song off their vinyl collection. I did not bring my camera, so I leave it to your imagination and these blurry snippets of the nights in Osaka. If you see this pattern as a graffiti sprayed somewhere, you can follow the path and will end up in a really cool (and really dark) bar. It is pretty hard to find and there is lots of mystery around it, so I will leave you with this hint. There are lots of tiny bars in a basement, most of them have a theme and it pays off being brave and just walking in, even when the front door does not really show what is happening inside.